Former Georgian President Mikheil Saakashvili speaks during a press conference in Lviv, Ukraine, Sept. 11, 2017. A day after forcing his way past border guards back into Ukraine, former Georgian President Mikheil Saakashvili said he would unite the opposition against his former ally President Petro Poroshenko and planned to campaign for support. Saakashvili wants to unseat Poroshenko at the next election, accusing the president of reneging on promises to root out corruption and carry out reforms made during the 2014 Maidan protests, which ousted a pro-Kremlin leader. At present it seems unlikely that Saakashvili, who studied in Ukraine and speaks fluent Ukrainian, will come to power. His Ukrainian citizenship, bestowed by Poroshenko when he made him governor of Odessa in 2015, has been withdrawn, and polls show little support for his party, the Movement of New Forces. Ukrainian President Petro Poroshenko delivers a speech to parliament in Kyiv, Ukraine, Sept. 7, 2017. "I am fighting against rampant corruption, against the fact that oligarchs are in full control of Ukraine again, against the fact that Maidan has been betrayed," Saakashvili said at a press conference in the city of Lviv. Saakashvili divides opinion. Supporters see him as a fearless crusader against corruption but critics say there is little substance behind his blustery rhetoric. Back home in Georgia, his time in office was tarnished by what critics said was his monopolizing power and exerting pressure on the judiciary. He was president at the time of a disastrous five-day war with Russia in 2008, a conflict that his critics argued was the result of his own miscalculations. Saakashvili says he does not covet the presidency himself and wants to promote a new, younger politician to the post. But while perhaps not a threat as a direct rival, Saakashvili could prove to be an effective weapon against Poroshenko for powerful opposition figures like Yulia Tymoshenko, who was with him at the border on Sunday. Poroshenko trails in the polls behind Tymoshenko, a former prime minister and leader of one of Ukraine's largest opposition parties. Ukrainian opposition leader Yulia Tymoshenko speaks during a press conference in Lviv, Ukraine, Sept. 11, 2017. "This is a marriage of convenience between Tymoshenko and Saakashvili, but the parties have different interests," said political analyst Volodymyr Fesenko. "She tries to use this situation with the hope that this will provoke a political crisis in Ukraine and lead to early elections." Saakashvili's relationship with Poroshenko dates back nearly three decades to when they were students at the same university in Kyiv and their shared opposition to the Kremlin later brought them together as politicians. But a bitter spat erupted in November 2016, a year after Poroshenko invited Saakashvili to be the governor of the region of Odessa to help drive reforms. The latter quit, accusing Poroshenko of abetting corruption and turned into one of his loudest critics. Meanwhile Poroshenko's office said Saakashvili had failed to deliver change as governor and said his Ukrainian citizenship was withdrawn because he allegedly put false information on his registration form. Saakashvili says the decision was politically motivated. It left him effectively stateless as Georgia has also withdrawn his citizenship. On Sunday evening Saakashvili and his supporters forced their way past a cordon of border guards to return to Ukraine from Poland. "It does not matter who violates the state border - invaders in the East or politicians in the West. 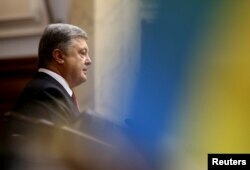 There always must be legal responsibility," Poroshenko said in televised remarks on Monday. The president said Saakashvili should have used Ukrainian courts to challenge the revocation. "Now this is a matter of law enforcement agencies and they have begun to act," Poroshenko said. Saakashvili said he would travel to all regions of Ukraine to unite "different political forces around a common theme that we must have a democracy and we should not let oligarchs hold sway." Ukraine's record of implementing reforms has been patchy since Poroshenko took office in 2014. Reformist lawmaker Mustafa Nayyem, one of the faces of the Maidan protests and a member of Poroshenko's faction in parliament, traveled with Saakashvili on Sunday and accused the Kiev authorities of trying to silence opponents. "We didn't want this country when we stayed on Maidan," he told reporters. "We wanted a country in which opponents, political opponents, have a right to say what they want." Former Georgian President Mikheil Saakashvili is surrounded by his supporters as he arrives at a checkpoint on the Ukrainian-Polish border in Shehyni, Ukraine, Sept. 10, 2017. Saakashvili may yet face arrest. Police have launched a criminal investigation into Sunday's incident, while General Prosecutor Yuriy Lutsenko said those who crossed the border illegally would be prosecuted. Kyiv could leave Saakashvili alone, arrest him and possibly extradite him to Georgia. Saakashvili took power in Georgia after a peaceful uprising, known as the Rose Revolution, in 2003. The 49-year-old is now wanted on criminal charges in Georgia, which he says were trumped up for political reasons.